When the mad sorcerer Devis was defeated, his enemies vowed his work would never be seen again. They bound his knowledge to their own minds, concealing it from the world. For years the order of the Stewards protected this knowledge, but now an old enemy has arisen, determined to claim what is better left hidden. Bring legendary heroes and infamous monsters to your Descent: Journeys in the Dark Second Edition game with the Stewards of the Secret hero and monster collection. Explore the unique strengths and abilities of these monsters and heroes by playing the included quests individually or through the use of Rumour cards. 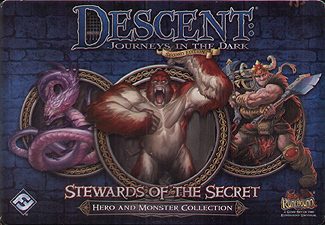 With 4 heroes, 3 monster groups, and 2 new quests, the Stewards of the Secret hero and monster collection gives fresh options to your Descent: Journeys in the Dark game. Descent: Journeys in the Dark Second Edition is required to play.